Your MacBook allows you to do many handy things in a Numbers document. Once you learn to navigate through your spreadsheets, there are multiple way to edit so your document appears exactly as you need it to. You can use the scroll bars to move around in your spreadsheet, but when you enter data in cells, moving your fingers from the keyboard is a hassle. For this reason, Numbers has various movement shortcut keys that you can use to navigate. After you commit these keys to memory, your productivity shoots straight to the top. To select a range of multiple adjacent cells, click a cell at any corner of the range you want and then drag in the direction you want. Either click the cell or press the spacebar. A cursor appears, indicating that the cell is ready to hold any data you type. 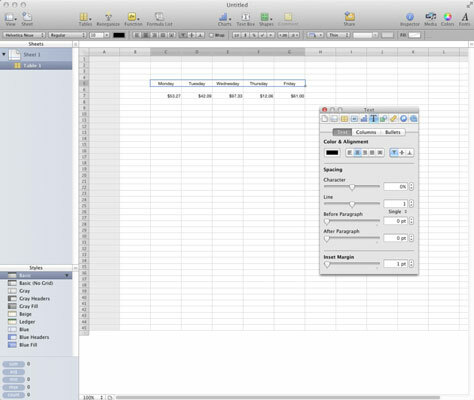 Spreadsheets can use both numbers and text in a cell — either type of information is considered data in the Spreadsheet World. To edit data, click in the cell that contains the data to select it and then click the cell again to display the insertion cursor. Drag the insertion cursor across the characters to highlight them and then type the replacement data. To simply delete characters, highlight the characters and press Delete. When you’re ready to move on, press Return (to save the data and move one cell down) or press Tab (to save the data and move one cell to the right). Click the Text Inspector button on the Inspector toolbar to display the settings. Click the corresponding alignment button to choose the type of formatting you want to apply. You can choose left, right, center, justified, and text left and numbers right. Text can also be aligned at the top, center, or bottom of a cell. You can also select the cells you want to align and click the appropriate alignment button in the Format bar. Do you need to set apart the contents of some cells? For example, you might need to create text headings for some columns and rows or to highlight the totals in a spreadsheet. To change the formatting of the data displayed in selected cells, select the cells, rows, or columns you want to format and then click the Font Family, Font Size, or Font Color buttons on the Format bar. For a row: Right-click and choose Add Row Above, Add Row Below, or Delete Row from the shortcut menu that appears. For a column: Right-click and choose Add Columns Before, Add Columns After, or Delete Column from the shortcut menu that appears. If you select multiple rows or columns and choose Add, Numbers inserts the same number of new rows or columns as you originally selected. You can also insert rows and columns using the Table menu.